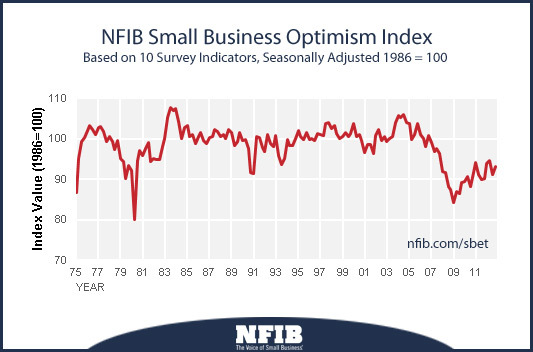 US small business optimism continues to improve gradually, but still remains at recessionary levels. One of the big problems for small businesses remains the uncertainty in future economic conditions. 23% of survey respondents say they have no clue what to expect from the economy going forward. That's the highest level of uncertainty since the Jimmy Carter administration (see video below). And as discussed earlier (see post), uncertainty can materially inhibit economic growth. Credit conditions don't seem to be a problem in part due to the lack of demand. With uncertainty at such high levels, the last thing a number of small businesses want to do is increase debt levels. Weak sales are the number one single issue cited in the survey, but regulation and taxes are still a major concern for US small business - which of course contributes to more uncertainty. DB: - Together, government requirements and taxes are cited by 39% of small businesses as their biggest problem among the eight remaining components. While this is down from 42% in September, it is clearly an elevated reading that likely needs to fall substantially further for small business confidence to ultimately trend higher. Just to put things in perspective, small businesses represent half the private GDP and half the private workforce in the US (see video below). That explains in part the anemic economic growth in the US over the last several years.